The Hereford Angus Galloway Breeder’s Association was found on the 1st of July 1988 and been carrying on its work ever since, for the benefit of the Hereford breed and breeders. 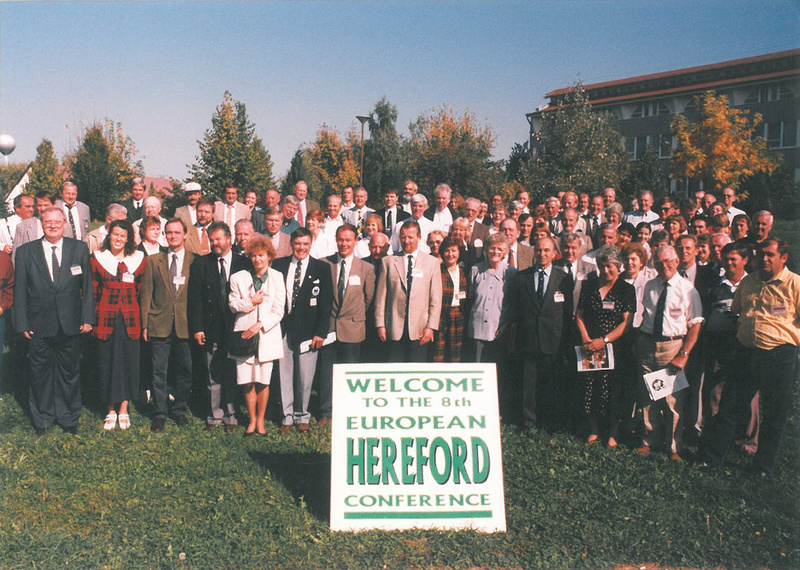 Hereford beef cattle was brought to Hungary by British import in 1970, establishing pure blood Hereford breeding in Hungary. After this, 4000 Hereford breeding cattles were imported from the USA and Canada. To preserve the great genetic abilities of the breed, we continue to import adulterant and embryos from world class suckling cows and bulls for service. We use mostly British, Australian, New Zealander, Irish and South-American bloodlines. 90% of the Hungarian Hereford stock is homozygote polled. The stock-farm is located in the Bodrogköz, enclosed by two rivers Bodrog and Tisza. Looking at its geographic capability it has great quality fieldland. Derczó Ltd. was founded in 1996 with 80 pregnant heifers with excellent genetic abilities. In the next 20 years it has expanded to 1200 suckler cows. The starting stock was founded in 2008 with 140 pure-blooded Hereford suckler cows coming from the Derczó Ltd., founded by the family. The stock developed with breeding work, aimed coupling, concious selection by using adulterant from Hereford bulls for service in the international front-rank consists of 400 cows, 250 pregnant and interemdiate heifers and 20 bulls for service. In the stock they’re producing bulls for service that passed the bull performance test. The territory of the farm is 1000 ha from which 520 ha is grassland, 480 ha is arable used for growing cereals, oil-seeds, leguminous plants and corn. The stock farm is a regular participant of regional and national agricultural and food industry exhibitions with great success. Their Hereford bull for service won the blue ribbon of the 76th National Agricultural and Food Industry Exhibition and Fair in 2013. Mezőfalvai Farm lays on 8595 ha land that consists of 6490 ha arable, 1572 ha grassfield and 533 ha land for other usage. The fieldland is a borderland between the Rónaság of the Great Hungarian Plain, the Transdanubian Mountains and the Somogy Hills. The economic organization is built on seven main sectors, which are strongly connected. Among these, crop and seed production and livestock breeding are the most significant. The farm has 200 employees, which makes it the largest agricultural employer of the region. The company’s dairy Holstein-stock in Világospuszta counts 200 cows with more than 11.000 l lactation milk yield per head. Thanks to their high quality breeding work, Mezőfalvai Farm has the QUALIFIED BREEDER title. The farm’s beef production reaches back to the 1980’s and consist of two main pillars; the Hereford stock of 300 suckler cows, 20 bulls for service and 50 pregnant heifers and a crossbreed Hereford commodity female stock of 800. Based on the bull performance tests they execute, numerous bulls for service are sold to international markets. Thanks to the breeding work and their breeding stock with exquisite genetic abilities, Mezőfalvai Farm has won the blue ribbon for breeding at several agricultural exhibitions. The family owned Jankovich Birtok is located in South-West Hungary, on the brink of Somogy and Baranya county, on the edge of Zselic Landscape Protection Area and Somogy Hills. The estate was found by József Jankovich de Jeszenice in 1996. The main profile of the estate is arable crop production, fruit production, beef cattle breeding, sylviculture and game farming. The estate currrently owns a stock of 120 Hereford suckling cows with excellent genetic abilities. With aimed coupling, and concious breeding work they are able to sell premium quality breeding cattle.